After a long illness Princess Khadiga Aziz Hassan passed away in Cairo on June 2. 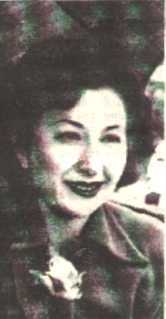 Born in 1919, she was a great-granddaughter of Khedive Ismail (1830-95) and a granddaughter of Hassan Pasha (1854-88) who served in the Ottoman army with the rank of Field Marshal. Her father General Aziz Hassan Pasha (1873-1925) was a cousin once removed of King Farouk (1920-65). From his Spanish wife Ikbal Hanem whom he married at Kerman in 1917, Prince Aziz Hassan had two sons and two daughters including the late Princess. 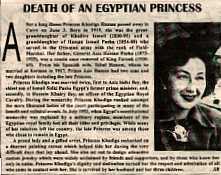 Princess Khadiga was married twice, first to Aziz Sidki Bey, eldest son of Ismail Sidki Pasha, Egypt's former prime minister, and secondly to Hussein Khairy Bey, an officer of the Egyptian Royal Cavalry. During the monarchy Princess Khadiga ranked amongst the most liberated ladies of the court participating in many benefit and cultural events. In July 1952, when a military regime displaced Egypt's constitutional monarchy members of the Egyptian royal family lost all their titles and privileges. While many of her relatives left the country, the late Princesses was among those who chose to remain in Egypt. A proud lady and a gifted artist, Princess Khadiga embarked on a discreet painting career which help tide things over during the very difficult days that lay ahead. She also set out to design attractive custom-jewelry widely acclaimed by friends and supporters, and by those who knew her only in name. Princess Khadiga's dignity and dedication earned her the respect and admiration of all whom came in contact with her. Princess Khadiga Hassan is survived by her husband and three children.